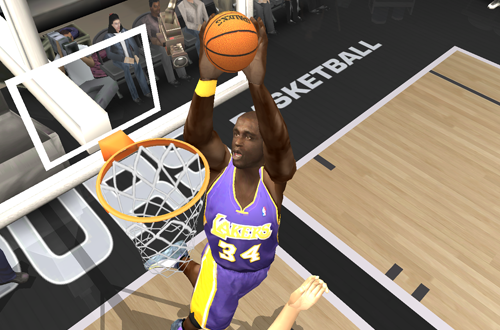 It seemed as though EA Sports listened very carefully to the criticisms of NBA Live 2003, as many of them were addressed in NBA Live 2004. The big, booming blocks that rocketed to the other end of the court? Gone, replaced by far more realistic swats that could be kept in bounds. Scoring and field goal percentages were toned down, Freestyle moves weren’t quite as cheesy, and overall the gameplay resembled the real NBA much more closely, given the technology of the era. This came as a great relief to gamers who felt that NBA Live 2003 had strayed too far from what they wanted the series to be. That being said, the gameplay is a bit too fast-paced and frantic out of the box (and Fatigue was set to zero by default), but that was no longer a huge problem thanks to one of the best new features of NBA Live 2004: gameplay sliders. Sliders achieved what ratings tweaks in NBA Live 2003 could not, giving us greater control over the gameplay experience, allowing us to adjust the level of realism as desired. They were also useful in adjusting the difficulty between the preset levels, and in some cases, making the challenge a bit fairer. However, compared to other games in the series, Superstar difficulty in NBA Live 2004 is actually quite fair and reasonably balanced. With a few slider tweaks, NBA Live 2004 played a very fun game of basketball, with a good amount of realism. There were still some cheesy moments of course, and if you try to play it with more realistic tactics suited to more modern basketball games, some of them aren’t as effective as they should have been (such as mid-range jumpshots). In particular, the new Pro Hop move could be abused, even on Superstar difficulty. There was a risk/reward factor as it was possible to lose the ball, commit a charging foul, or simply fail to elude the defender, but it was pretty powerful. It didn’t help that there was no slider for its effectiveness; that wouldn’t come until next year. Still, a lot of work went into making NBA Live 2004 more closely resemble real basketball. On top of the new blocking animations and physics, NBA Live 2004 introduced technology called 10-Man Freestyle, a motion capture technique that resulted in more life-like player interactions. Player collisions are far more frequent and noticeable in NBA Live 2004 compared to its predecessors, with more two-man animations. Double team animations force players to lose control of the ball, players fight for position in the post, and there’s a lot more physicality in the paint. It’s primitive by today’s standards, but players do feel like they have a presence. 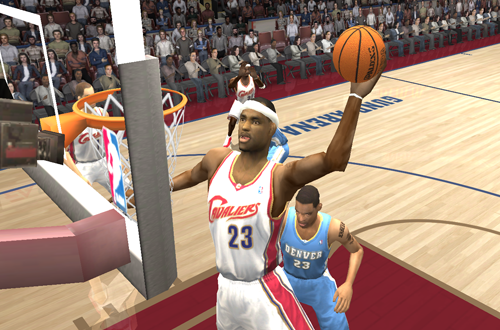 NBA Live 2004 retained the right stick dribbling controls of NBA Live 2003, while making a significant change to the controls on the face buttons. It’s the first game in the series that split shooting controls into two buttons: one button for dunks and layups, the other for jumpshots. If a player was too far away from the basket to attempt a layup or dunk, they put up a floater instead. The Pro Hop button could also be used to perform a drop step, which was effective, but not quite as overpowered as the Pro Hop. Tip dunks could be performed automatically on the offensive glass, by holding turbo and the rebound button while moving towards the basket. Free throws still used the T-Meter, but the system was revamped slightly for NBA Live 2004. Instead of the meter appearing beside the player or in the corner of the screen, it was now placed on the backboard, with the camera looking over the player’s shoulder during free throw attempts. A box in the middle of the backboard represented the “success zone”, with better free throw shooters having a larger box, and thus a larger margin for error. Shots were aimed by stopping two moving lines so that they intersected the box, the first one representing the aim left or right, the second the distance. In my opinion, it’s the most precise version of the T-Meter approach. 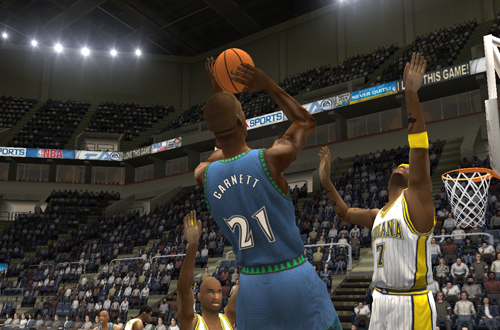 From the expanded controls to the increase in realism, NBA Live 2004 definitely delivered on the gameplay front. Visually speaking, however, the game did seem to be a slight step backwards in a few areas. Its graphics are still fairly sharp and quite good for a game released in 2003, but player faces definitely aren’t on par with NBA Live 2003. Player models are a little out of proportion, especially their feet, though it’s more noticeable in instant replay. There are some animations that don’t hold up too badly, but NBA Live’s infamous hunched over dribbling animation made its debut here, and there are some dunks and other moves that haven’t aged very well. Of course, that’s looking at the game with an eye that has seen far better animations in basketball titles that have come along since then. A lot of the more arcade-style moves from NBA Live 2003 were toned down and replaced, and the courts and arenas still looked very nice. Other presentation elements were enhanced as well, with the silly “courtside comedy” cutscenes nowhere to be found. They were replaced by proper starting lineup introductions, and other scenes that mimicked what we saw on TV. The crashing sound effect was still present on dunks, but with everything else being far more realistic, it’s not a huge distraction. Although NBA Live 2004 doesn’t feature any real network branding, the presentation was far closer to an NBA broadcast thanks to the addition of Marv Albert and Mike Fratello on commentary. With all due respect to the late Don Poier and Bob Elliott, who did a fine job from NBA Live 2001 through NBA Live 2003, Marv and Mike added much more authenticity to the presentation. It was also great to finally hear Marv’s famous call of “Yes!” in an NBA Live game; if you glance back through our old Wishlists, you’ll see that Marv’s inclusion is something that gamers had been wanting for a long time. After a few years of little to no improvement, Franchise Mode was re-branded into Dynasty Mode, a name that the NBA Live series has kept through to today. The brand new mode retained features such as free agency, the rookie Draft, and other roster management functions, but also added a couple of popular Wishlist items. It was now possible to trade Draft picks, while an interest meter provided an indication of how likely a team was to give up a player, and how interested they were in a player you were offering. It was great to have that extra layer of logic in player transactions, making trades more than just a matter of matching Overall ratings. Jersey retirement was another cool new feature in NBA Live 2004’s Dynasty Mode, though it was something that had to be earned. If a retiring player hadn’t made a significant contribution to your team during their tenure, the option to retire their jersey wouldn’t be offered. Of course, your idea of what constitutes a significant contribution may differ from NBA Live 2004’s standards, which generally meant winning a championship and Finals MVP. Players also had to spend their last year with your team; if a player had given you ten fantastic seasons but finished their career elsewhere, you’d miss out on the opportunity to retire their jersey. NBA Live 2004 did away with DStats, with simulated stats being governed solely by player ratings, and thus improving and regressing as a player improved, peaked, and declined. The feature that most long-time basketball gamers probably remember are the Dynasty cutscenes that played upon making a trade or signing, drafting a rookie, or the retirement of a player. Other cutscenes included award presentations, and scenes of your team running through practice drills during training sessions. There was also an in-game NBA Inside Stuff magazine, with the cover of a new issue displayed at key points of the season. Pre-season training camp and in-season training sessions were welcome additions to player development. By assigning percentages of training time in four different areas – shooting, offense, defense, and conditioning – it was possible to gain extra ratings boosts on top of the improvement that took place between seasons, according to the hidden potential attribute. Unfortunately, a bug in the training camp logic resulted in players declining in a particular area if the amount of assigned training time was less than 20%. Midseason training sessions were available at the cost of 800 Dynasty Points (individual session) or 2000 Dynasty Points (team session). Dynasty Points were earned by performing certain in-game tasks, namely reaching specific statistical marks as a team and with individual players. In addition to training sessions, they could be used to purchase Dynasty Extras that provided ratings boosts for one game, five games, ten games, or the entire season. They ranged from shooting coaches to a new locker room, and even a team plane. Overall, Dynasty Mode was a much deeper experience than the old Franchise Mode. The only real drawback was an inability to control more than one team, which was a side effect of the added management features. Completing items on the Task List also earned NBA Store points, which were used to unlock items including shoes, jerseys, practice gear, and player accessories. The NBA Store was part of the new My NBA Live menu, which also included the EA Sports Hall of Fame. The Hall of Fame displayed retired jerseys – NBA Legends by default, jerseys for your retired players in Dynasty Mode – along with models of all the NBA player and team trophies, which also listed the award histories going back to the 1999 season. My NBA Live was also the place to enter cheat codes, and set your favourite team, which styled the menus accordingly. 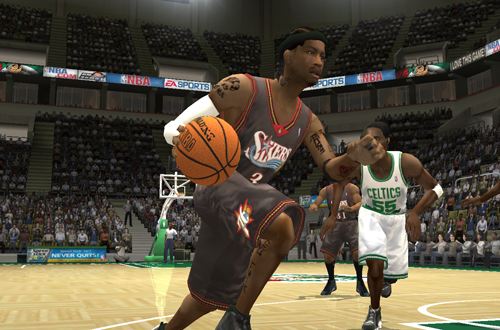 In terms of customisation, the PC version of NBA Live 2004 was about as patchable as NBA Live 2003 had been. It retained the same CustomArt system, which meant that custom shoes, accessories, practice gear, and even NBA jerseys could be assigned to individual players. Unfortunately, the in-game customisation features weren’t as impressive. Create-a-Player was quite limited in the amount of hair and beard styles, to say nothing of other facial features. Headshapes couldn’t be changed either, so created players tended to end up looking very similar and generic. Other roster management features remained more or less intact. NBA Live 2004 also included the Charlotte Bobcats, who weren’t set to debut until the 2005 season. Their roster was filled with generic placeholder players by default, and could be customised with real NBA players and created players alike, though the team could not be used in Season or Dynasty Mode. Notably, the in-game ratings system also switched from the traditional 50-99 range to 0-99, reflecting the values that were actually used in the database. This change also meant that some Overall ratings were calculated oddly, resulting in some players seeming very underrated in NBA Live 2004. NBA Live 2004 marked Michael Jordan’s last official appearance in the NBA Live series, as he remained in the game as a member of the 90s All-Stars, and available to sign from the Legends Pool. Released for the 2004 NBA season, it’s obviously also the NBA Live debut of the Draft Class of 2003, including LeBron James, Dwyane Wade, Carmelo Anthony, and Chris Bosh, all of whom are quite underrated in the default rosters. A few rookies including Kyle Korver and Sasha Pavlovic could be unlocked and added to the roster by using codes, or through DBF editing on the PC. 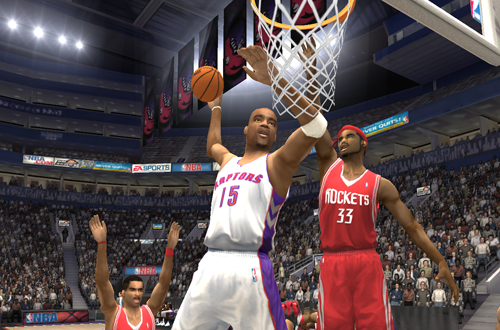 The console versions of NBA Live 2004 featured the EA Sports Bio; an initiative that was intended to reward gamers who purchased more than one EA Sports title in their 2003-2004 lineup, and spent a lot of time with the games. Clocking a lot of hours in the game and levelling up unlocked rewards such as points to purchase gear in the NBA Store, as well as directly unlocking certain jerseys and shoes. The EA Sports Bio feature wasn’t available in the PC version, but the modding capabilities on PC meant that we could add far more content than what was available in the console versions, so it wasn’t really missed. 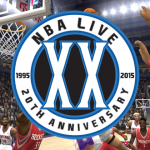 In its day, NBA Live 2004 was an outstanding basketball sim. While it may seem primitive now, and even its immediate predecessors were able to make some big strides, it’s clear to see why many of us loved it so much when it came out. In fact, it’s still fun to play today, which is probably why we have had a few people still making the occasional patch for it in recent years. When you consider how many improvements were made across the board in just one year, NBA Live 2004 is an even more impressive release. It’s definitely a classic, a high point in the NBA Live series, and it was definitely fun to dust it off once again for this retrospective. It was nice reading your retrospective about these 2 games. Yeah good read as usual Andrew, can’t believe how many hours I logged on Live 04! I think this and Live 06 are the greatest EA has ever put together. Thanks! Yeah, I’m definitely with you as far as NBA Live 2004 and NBA Live 06 are concerned. Never a bad thing to have “to much” content mate especially when it’s a labour of love! Perhaps! I probably just need to plan better. Still, got some ideas that hopefully everyone will enjoy. Good retrospective as always, Andrew. Never played this game though.